A Tesla Roadster, carrying a dummy passenger named "Starman," orbits the Earth after launching into space on the Falcon Heavy on Feb. 6, 2018. SpaceX's Falcon Heavy megarocket completed its first-ever launch today (Feb. 6), lifting off from Kennedy Space Center in Florida. The launch was jam-packed with incredible moments, captured in jaw-dropping photos. Here are some of our favorite images of the day. The Falcon Heavy's first stage consists of three Falcon 9 boosters strapped together. Those three columns of fire heading skyward was an awe-inspiring sight. The Falcon Heavy in flight on Feb. 6, 2018. A few moments later, the rocket reached max Q, or the point at which the rocket experiences the maximum pressure load that it will undergo during the flight. The three flaming boosters burned steadily as the rocket headed skyward. Two of the three first-stage boosters from the Falcon Heavy rocket touch down on landing pads after launch on Feb. 6, 2018. Two of the Falcon Heavy's first-stage boosters returned to Earth and completed a synchronized touchdown on two land-based pads. Watching one booster complete this maneuver is awesome — watching two boosters do it at the same time was like watching a science-fiction movie. "Starman" riding in a Tesla Roadster aboard a Falcon Rocket headed for a solar orbit, after launch on Feb. 6, 2018. This was a test flight for Falcon Heavy, so SpaceX did not load up the rocket with a real payload. 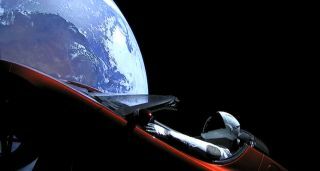 Instead, Elon Musk, the company's founder and CEO, put a Tesla Roadster on board, carrying a mannequin passenger named "Starman." Cameras mounted on the payload delivered amazing views of Starman and the Roadster hovering over the ocean early in the flight. Later, SpaceX posted on YouTube a livestream from one of the cameras, which shows the Roadster orbiting Earth as a part of a planned 6-hour cruise phase. The curvature of the Earth is visible behind Starman's head, and a remarkable amount of detail can be seen on the planet, including clouds and the glint of the ocean. When the planet drifts out of view, the camera captures the pure blackness of space. What were your favorite moments from the launch?